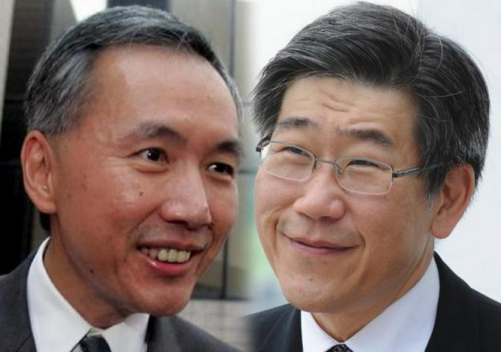 Robert and Philip Ng retained their six-year hold of the top spot in the latest Forbes Singapore Rich List, with a combined net worth of US$8.7 billion (S$11.8 billion). The Ng brothers, whose family controls Singapore's Far East Organisation and Hong Kong's Sino Group, countered property downturn and slow sales by investing $1 billion in several Australian ventures. The sluggish economy that saw a nine per cent decline in the Singapore dollar and a flat stock market, was markedly apparent in the rich list. Singapore's richest now have a collective net worth of US$92.3 billion, down from US$96.9 billion a year ago. Amidst the slowdown, property tycoon Kwek Leng Beng managed to retain his second spot on the list with a net worth of US$7.2 billion. His City Developments posted its highest-ever annual revenues of US$2.8 billion in 2014, up 17 per cent from the previous year, helped by contributions from overseas hotels. Coming up third is paint tycoon Goh Cheng Liang, who moved up four spots after his shares in Japan's Nippon Paint jumped 62 per cent in the past year. Goh's fortune increased by US$3.7 billion in 2014 to hit US$6.9 billion this year, making him the biggest gainer on the list. Facebook co-founder Eduardo Saverin added more than US$1 billion from the company's rising shares and made the sixth spot on the list. According to The Straits Times, Saverin has invested in about five Singapore tech start-ups since his arrival here in 2009. Industry insiders estimate his total investment to be over US$3 million. Raj Kumar and Kishin RK, a father and son duo who have a combined fortune of US$2.4 billion, enter the top 10 list for the first time. They are in the process of merging their respective property firms Royal Holdings and RB Capital to meet their target of amassing gross assets of US$8 billion by 2020. Healthcare entrepreneur Loo Choon Yong of Raffles Medical Group who has US$1 billion under his belt, is 28th on the rich list. Loo enters the billionaire ranks for the first time, bringing the total number to 28, up from 26 last year. The minimum amount required to make the list was US$420 million, down from US$450 million last year.